HandsFreeMichigan, a campaign to make any manual cell phone usage illegal on Michigan’s roads, launched HandsFreeMichigan.org Wednesday. The effort is led by Steve Kiefer, senior vice president of global purchasing and supply chain at General Motors Co. in Detroit, whose son, Mitchel, was killed by a distracted driver in September 2016. Kiefer, through the Mitchel Kiefer Foundation, wants to make Michigan the 17th state in the union to make manual cell phone use while driving illegal. It is an idea endorsed by Gov. Gretchen Whitmer and addressed in bills currently under consideration by the Michigan Legislature (HB-4181, HB-4198, and HB-4199). Kiefer says there are 16 states that already have adopted true hands-free legislation. That means while you are in the car, you cannot hold a phone. The ultimate goal, according to Kiefer, is a hands-free Michigan, and eventually a hands-free U.S. The website launch took place at Detroit Public Safety Headquarters to celebrate what would have been Mitchel Kiefer’s 21st birthday. The announcement also served as a harbinger to National Distracted Driver Awareness Month in April. The Kiefers were joined by Detroit Police Chief James Craig. To learn more and to support hands-free legislation, visit HandsFreeMichigan.org. In related news, New Hudson’s Feldman Automotive also is raising awareness of the dangers of distracted driving, which can include, in addition to cell phone usage, eating, grooming, talking to passengers, adjusting the radio, and even using navigation systems. 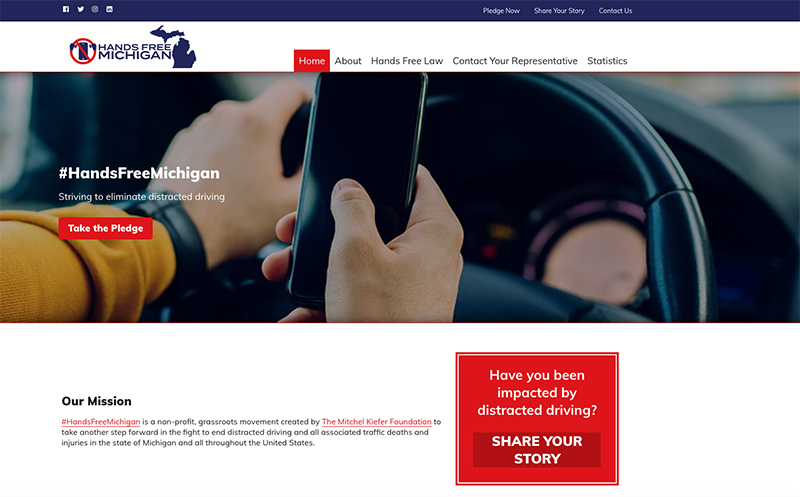 Feldman Automotive announced on Wednesday that it has partnered with the PEERS Foundation to raise $2.5 million to increase awareness of distracted driving and bring the message directly to high school students in Michigan and Ohio. PEERS will conduct 40 events at high schools throughout the two states using augmented reality distracted driving education simulators to teach teens the dangers of driving while distracted. The simulators will be at the Feldman and Mark Wahlberg dealerships April 8-12.